LOS ANGELES - May 25, 2018 - PRLog -- The United Premier Soccer League (UPSL) is excited to announce United Serbian Soccer Club as a new member starting with the 2019 Spring Season. Based in Milwaukee (Wisc), United Serbian Soccer Club begins UPSL play in the Midwest Conference, and will host its games at the Saint Sava Soccer Grounds (3201 S. 51st St., Milwaukee, WI 53219) in compliance with UPSL's Minimum Standards. United Premier Soccer League Commissioner Yan Skwara said, "We're very pleased to welcome United Serbian Soccer Club to the UPSL Midwest Conference. United Serbian Soccer Club has been around for more than 50 years, which speak volumes. The history of Serbian SC is a natural fit for our sustainable Pro/Rel model as the league targets the establishment of UPSL Championship (Tier 2) play in the Midwest Conference in 2019. Just like any promotion/relegation league around the world, if United Serbian SC is successful in its play on the field then the club will be promoted to Tier 1. We wish United Serbian Soccer Club the best of success in 2019." United Serbian Soccer Club is operated by its Board of Directors. Milwaukee (Wisc.) native Aleks Malinovic is the Treasurer and Director of Marketing for United Serbians. A graduate of the University of Wisconsin-Milwaukee, Malinovic, 27, is the owner of AM Solutions, a software development company in Milwaukee. United Serbian Soccer Club Treasurer and Director of Marketing Aleks Malinovic said, "We've been playing in the Wisconsin Soccer League since its inception, and now we're taking the steps to move forward and we want be on to bigger and better things. We have some new blood that's in charge of the team now and we just want to keep going. We have people who are passionate and who are trying to carry the team up to the next level." Started in 1964 during the height of ethnic-based soccer clubs in Milwaukee, United Serbian Soccer Club is a three-time Wisconsin Soccer League Major Division champion, claiming titles in 1973, '80 and '94. "We have a very rich history and we've always had a community-first approach full of some great players," Malinovic said. "But at the end of the day we're a soccer club and our job is to develop the best players possible. The UPSL gives us another opportunity to develop the players and the club." United Serbian SC was the WSL 2nd Division champion in 2017 and currently plays in the WSL's Major Division. The club has long been affiliated with United Serbian Soccer Club, a Milwaukee (Wisc. )-based youth club that began at the historic St. Sava soccer grounds. United Serbian SC soon will announce its upcoming game schedule. 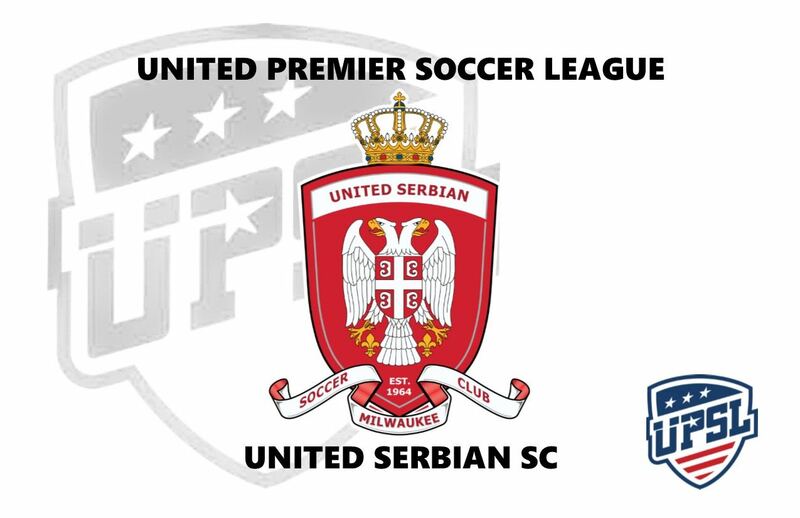 United Serbian Soccer Club is an American Soccer club currently based in Milwaukee, Wisc., and a new member of the United Premier Soccer League. United Serbian Soccer Club will begin play in the UPSL Championship. Founded in 1964, United Serbian SC can participate in the qualifying rounds for the Lamar Hunt U.S. Open Cup through their affiliation and membership with the UPSL, the U.S. Soccer Federation (USSF) and the United States Adult Soccer Association (USASA). The UPSL was formed in 2011 and currently includes more than 140 teams in Arizona, California, Colorado, Florida, Georgia, Idaho, Illinois, Indiana, Iowa, Kansas, Massachusetts, Michigan, Minnesota, Missouri, Nebraska, Nevada, New Hampshire, New Jersey, New Mexico, New York, North Carolina, Ohio, Oklahoma, Oregon, Pennsylvania, Rhode Island, South Carolina, Texas, Utah, Virginia and Wisconsin. UPSL is the fastest growing Pro Development League in the USA, with 140-plus teams targeted for 2018 Spring Season. Each UPSL team is individually owned and operated, and is responsible for maintaining either UPSL Pro Premier Division or Championship Division minimum standards.